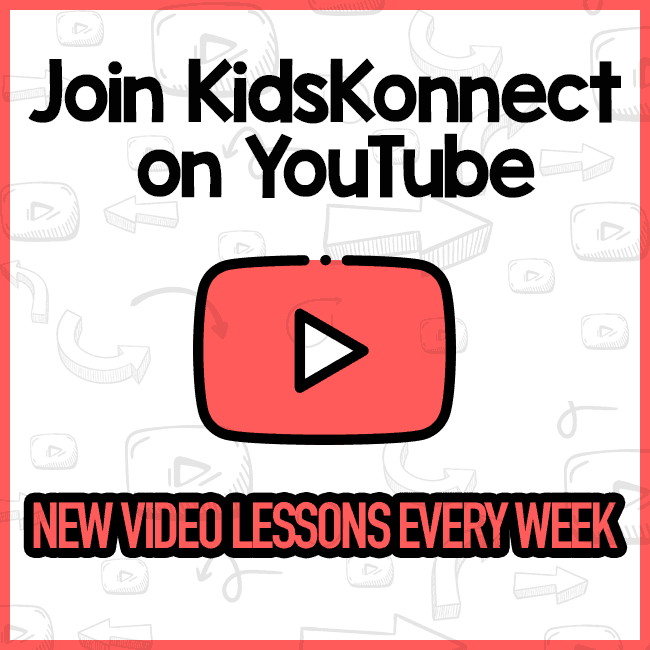 William Henry Harrison was the 9th President of the United States of America (1841). The first President from the Whig Party. He delivered the longest inaugural address in U.S history with almost two hours of speech and the shortest term in office with only 32 days. He was nicknamed as the “Old Granny” for being the oldest elected President of America prior to Ronald Reagan. 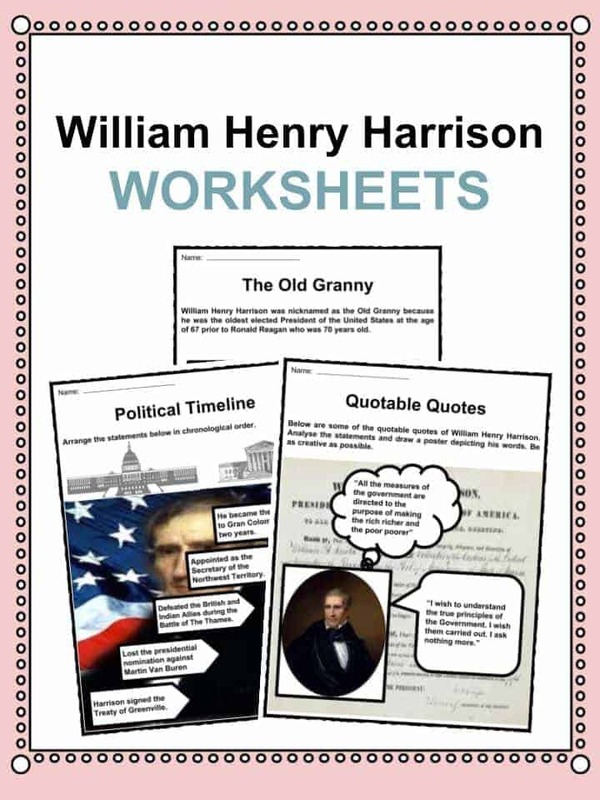 For more information on William Henry Harrison read the fact file below or download our comprehensive worksheet pack to utilise within the classroom or home environment. 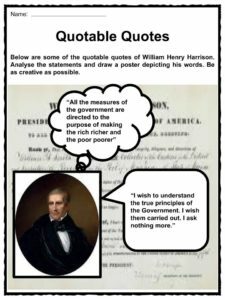 William Henry Harrison was born on February 9, 1773, in Charles City County, Virginia. 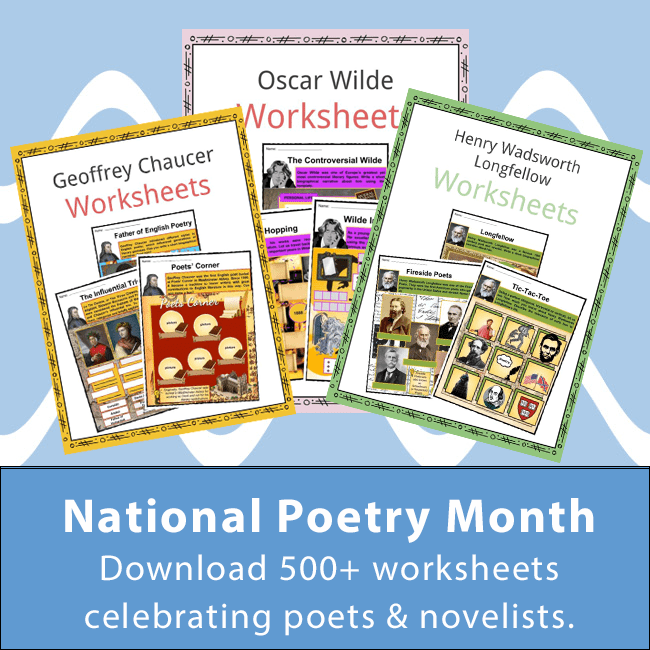 He was the youngest child of Benjamin Harrison V, one of the signers of the Declaration of Independence, and Elizabeth Bassett. In 1787 to 1790, he attended the Presbyterian Hampden-Sydney College and the University of Pennsylvania in 1790 to study medicine. Young William joined the the First Infantry army after the death of his father. Virginia Governor Henry Lee invited him in order to alleviate Harrison’s financial instability. On November 25, 1875, he married Anna Tuthill Symmes whom with he had ten children. William became a part of General Wayne’s victorious army during the Battle of Fallen Timbers in 1794. 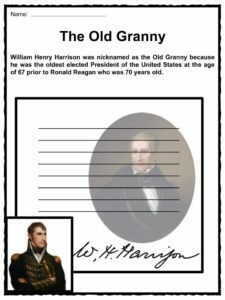 Lieutenant Harrison was one of the signers of the Treaty of Greenville ending the Northwest Indian War and opening the territory (now Ohio) to European and American settlers. 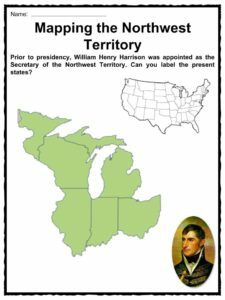 In 1798, he was appointed as the Secretary of the Northwest Territory by President John Adams and later on, in 1799, elected as its first representative. By 1813, during the War of 1812, Harrison led the U.S Army in the Battle of the Thames where he defeated the British troops and the Indian allies. The victorious battle along the Tippecanoe River marked the political career of both Harrison and his running mate, John Tyler. Three years later, he was elected to the U.S House of Representatives, where he stayed until 1819. He was then elected to the Ohio State Senate to 1821 and became a part of the U.S Senate in 1824. Harrison served as the Minister Plenipotentiary to Gran Colombia for two years (1828-1829). 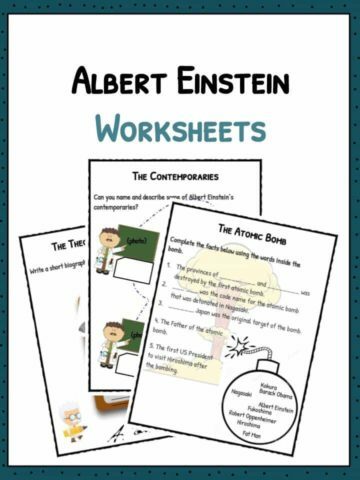 He was a primary critic of the military dictator Simon Bolivar. In 1836, he lost the Presidential nomination of the Whig Party against Vice President Martin Van Buren. 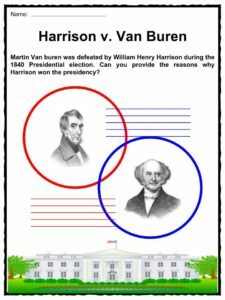 After President Van Buren’s term, Harrison defeated him in the 1840 presidential election. William Henry Harrison took an oath as the 9th President of the United States of America on March 4, 1841, at the East Portico, U.S Capitol. The economic crisis during Van Buren’s term was used for Harrison to win. During his inauguration day, he was the first president to have his photograph taken. Harrison’s two hours inaugural address was considered as the longest in U.S history. He reiterated his different economic and political plans and compared to his predecessors. As a head start, President Harrison promised to recharter the Bank of the United States and to undo former President Jackson’s “Spoils System”. On April 4, 1841, President Harrison died due to pneumonia. He suffered pneumonia three weeks after taking in office and never recovered. His body was initially kept at the Congressional Cemetery in Washington, D.C before it was moved to the Tomb State Memorial that was named after him, located in North Bend, Ohio. Harrison’s death led to the dilemma regarding the issue of succession. The Constitution did not clearly state on whether the Vice President should act as the President upon the President’s death. On May 1841, the Congress passed a resolution stating that the Vice President would serve the remainder of the term. 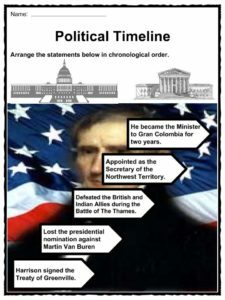 William Henry Harrison’s preempted presidential career was continued by his grandson Benjamin Harrison who became the 23rd President of the United States. 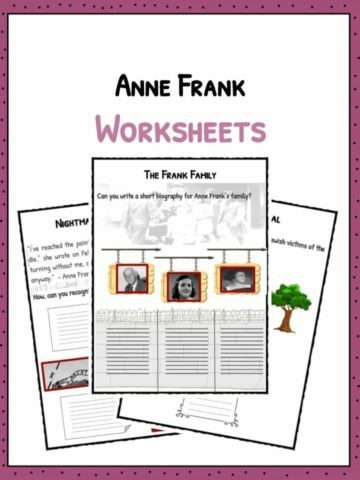 They were the only grandfather and grandson tandem to have become U.S Presidents. 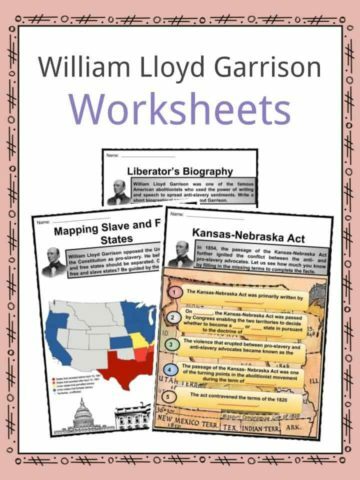 This bundle contains 11 ready-to-use William Henry Harrison Worksheets that are perfect for students who want to learn more about William Henry Harrison who was the 9th President of the United States of America (1841). 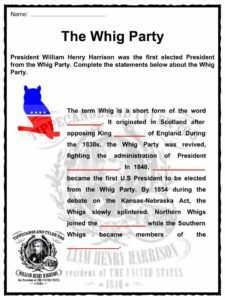 The first President from the Whig Party. He delivered the longest inaugural address in U.S history with almost two hours of speech and the shortest term in office with only 32 days.